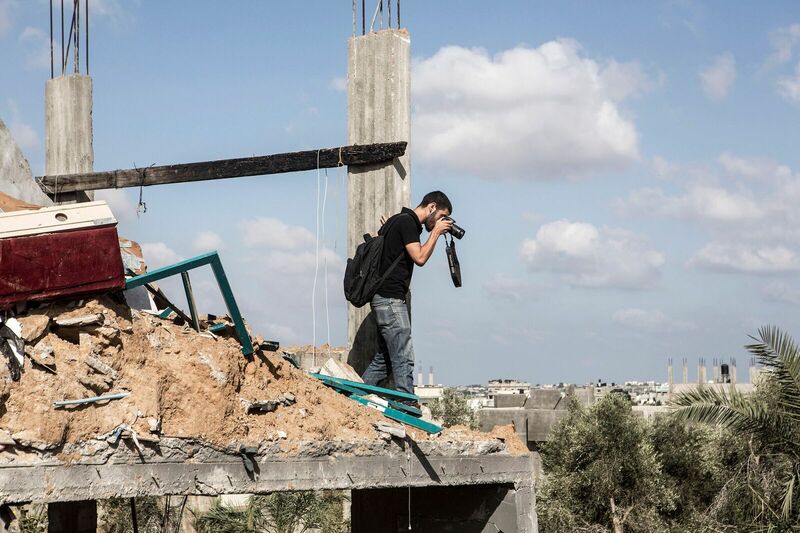 More than a week into covering Israel’s offensive in Gaza, my body was on auto-pilot: grab the equipment, look for a high point, climb, hold camera steady, document. And, of course, get people’s names – it wasn’t always possible to get much more than that. Often, I had to choose between catching a few more shots and running after those I had photographed in hopes they would share their names with me despite the chaos of the rushed funerals, hectic hospital corridors, and morgues overflowing with bodies, blood, sweat, and tears of the bereaved. It was in the hospitals that we often learned the news about the latest attacks. 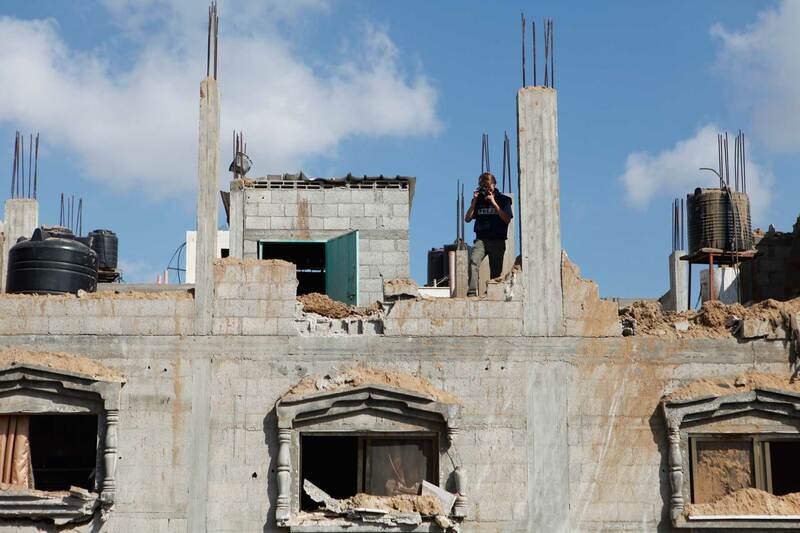 This was also how we found out about the scale of the destruction and death in the village of Khuza’a: in Khan Younis hospital, in the southern end of the Strip. 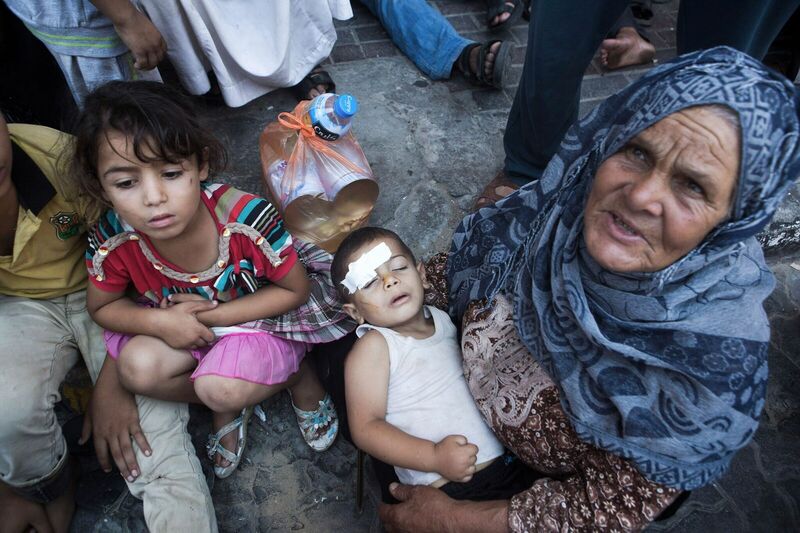 The hospital courtyard was full of people who had just managed to escape nearby Khuza’a, a besieged village. Ambulances could barely get through the crowds. Some people were crying, some screaming, and everyone tried to ask the paramedics arriving in the ambulances about their loved ones. 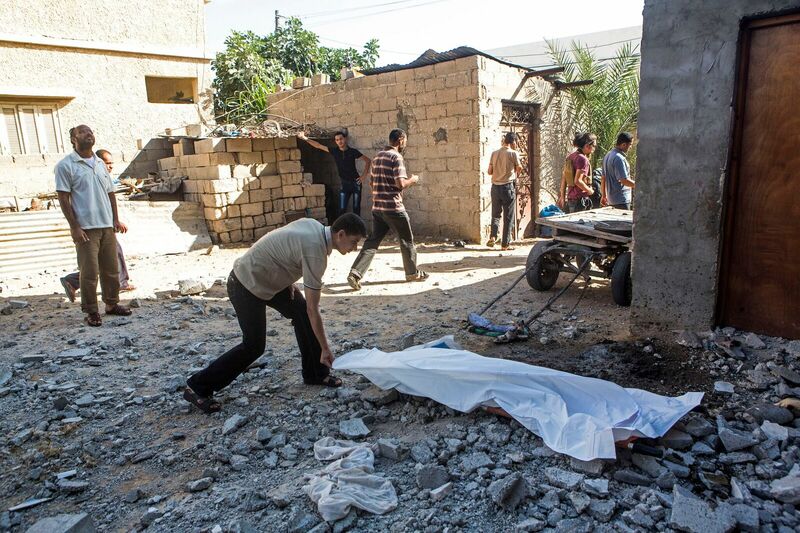 Many survivors had been forced to flee and leave injured and dead family members behind. 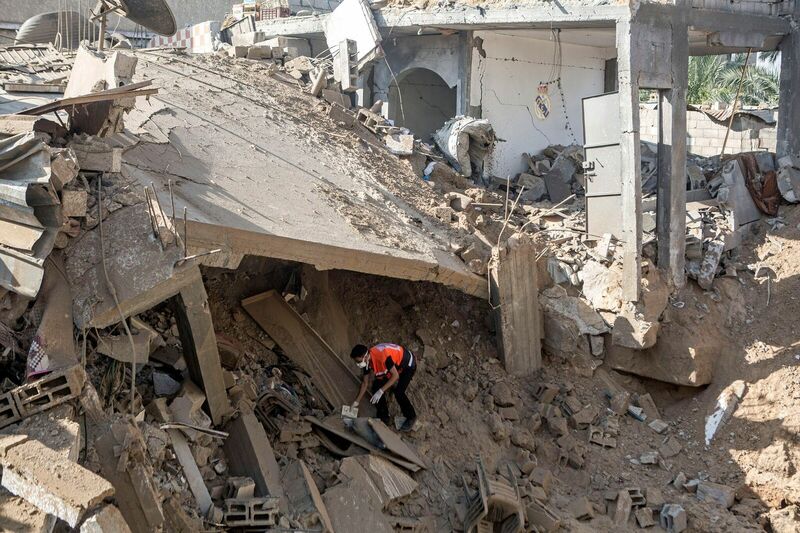 They told us about scores of dead, of others still trapped by the relentless bombing, of ambulances unable to reach the injured, of the flattened houses of their village. 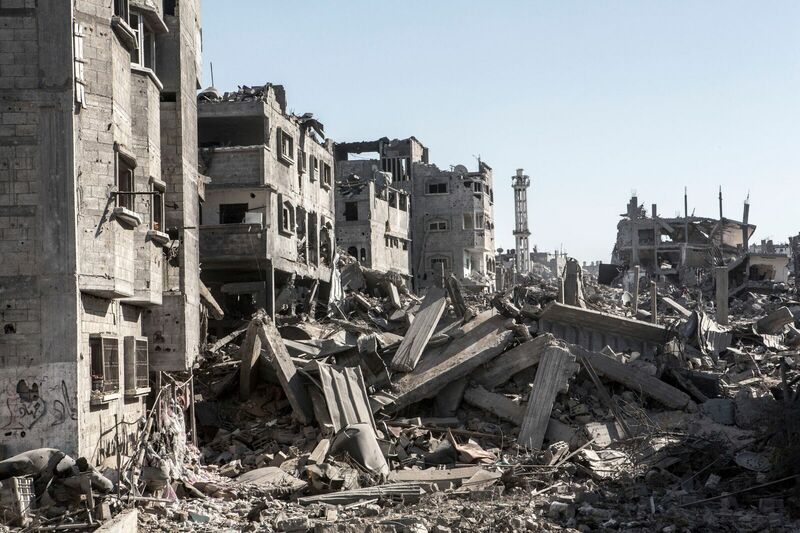 It was the end of July and we were not even close to realizing the full scale of the death and destruction the Israeli tanks, artillery, ground troops, and aircraft had wreaked upon Gaza’s border areas like Khuza’a. 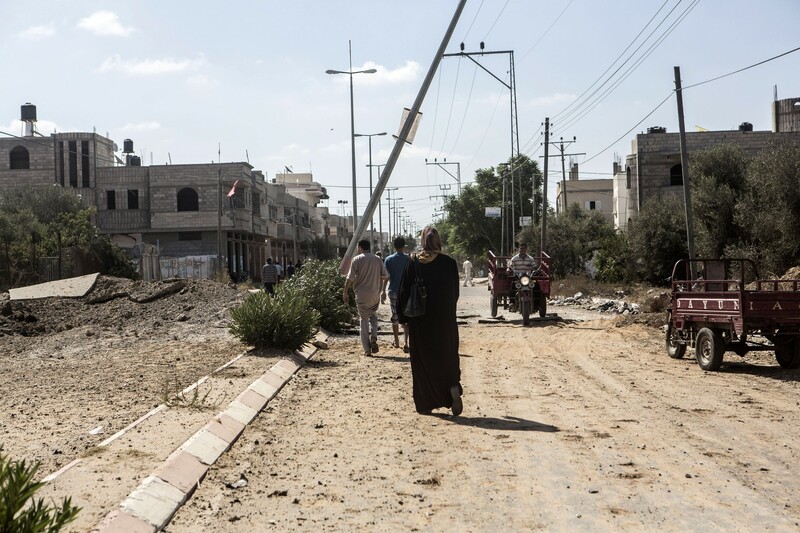 As the fighting intensified, the Israeli military declared the outer boundaries of the Gaza Strip to be “sterile combat zones.” The inhabitants, the majority of whom had been forced to flee, as well as medics and journalists, were barred from reaching the area. The intention behind the move, as noted by the UN’s independent commission of inquiry, was that “the people remaining in the area would no longer be considered civilians and thus benefit from the protection afforded by their civilian status”. 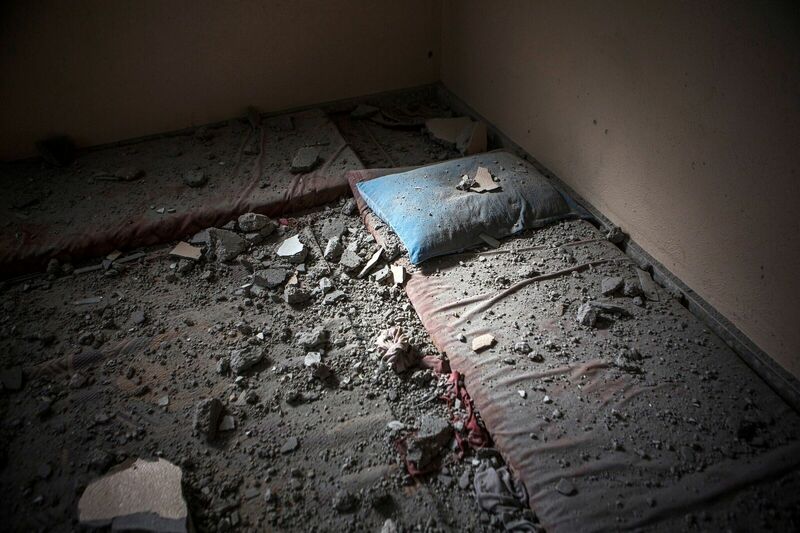 Two days after we met Khuza’a survivors, on 26 July, we woke up to news of a day-long ceasefire. As usual, when a brief truce was announced, we rushed with other journalists and photographers straight to the hardest hit areas, previously inaccessible due to heavy shelling and air strikes. On the way to Khuza’a, we squeezed ourselves into two cars with all of our equipment, the tacky “TV” signs taped to the hood hardly an assurance of our safety. 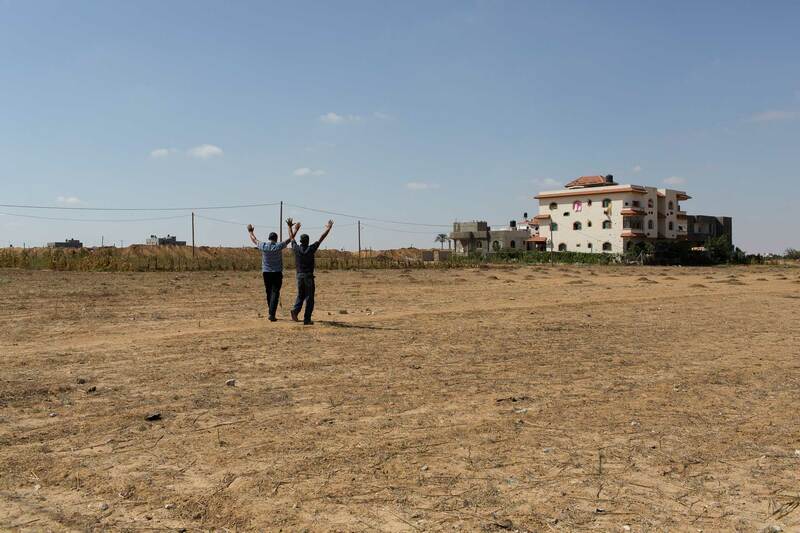 We raced down the Salah ad-Din road, crossing the Gaza Strip from north to south. Our Palestinian colleagues Tony and Mohammed were driving at full tilt, acutely aware of the route’s dangers. 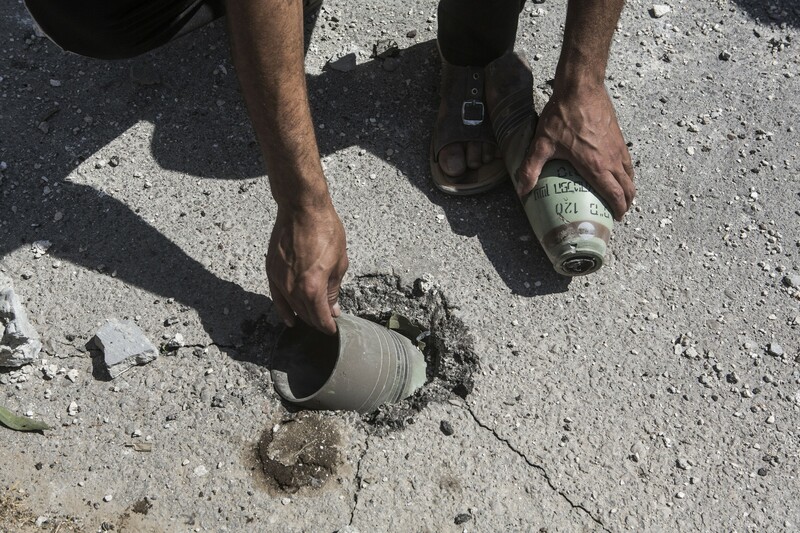 It was only later that we discovered that bored Israeli soldiers had tried to keep themselves entertained by targeting civilian cars on that same road. Upon reaching the outskirts of Khuza’a, we first noticed a fleet of ambulances and followed them into the nearby village of Abasan Kabira. We ran into a crowd of people. They too had used the ceasefire to return to their village. 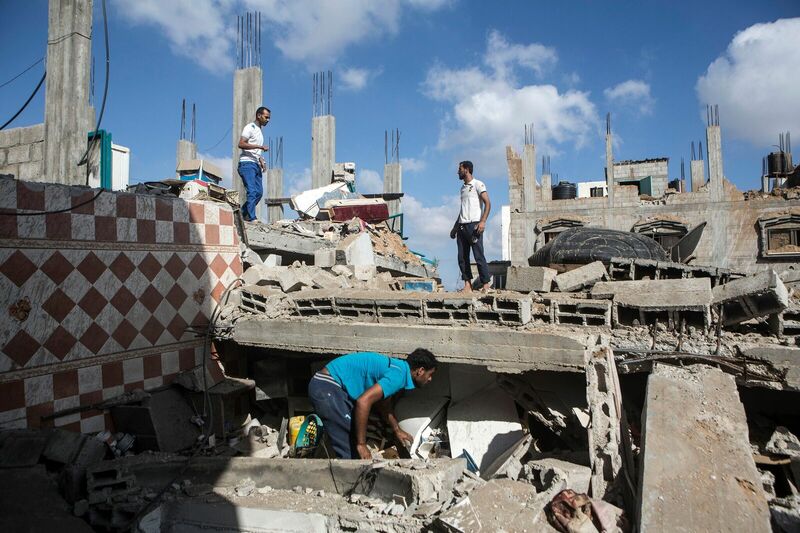 Impatiently awaiting the arrival of help, and still in shock after discovering the piles rubble that only a few days before had been their homes, they called to us: “Come here, this way! You need to photograph this, let the world see what happened.” Entering the yard of a corner-lot house, we saw a charred human leg, partially eaten by maggots. Paramedics were busy stretching a plastic sheet across the ground, collecting the scattered human remains. The air was filled with the distinct, thick smell of rotting, burnt flesh: repulsive, nauseating, and entirely unforgettable. At the entrance of Khuza’a we found another group of villagers. They were visibly anxious; the fear in the air was almost palpable. 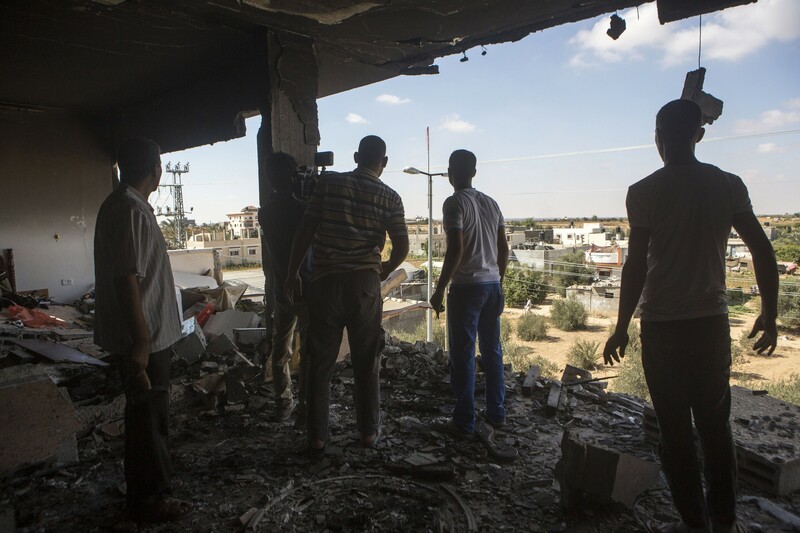 Ceasefires too played hell with the nerves of the Palestinians. During the sporadic, brief lulls in fighting, residents would try to enter and leave bombarded areas as quickly as possible, in desperate attempts to collect belongings and locate missing relatives, sharply aware that the bombings could resume at any moment. 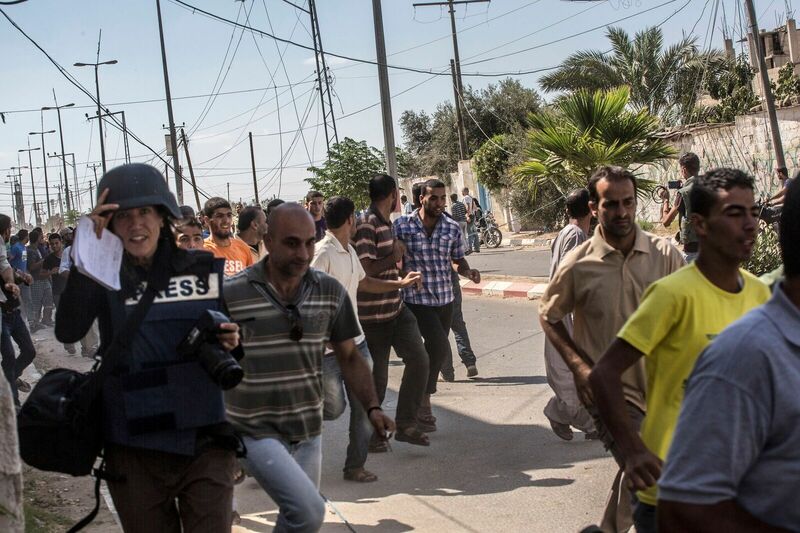 A few dozen Palestinians stood on the main road. They warned us against going any further. 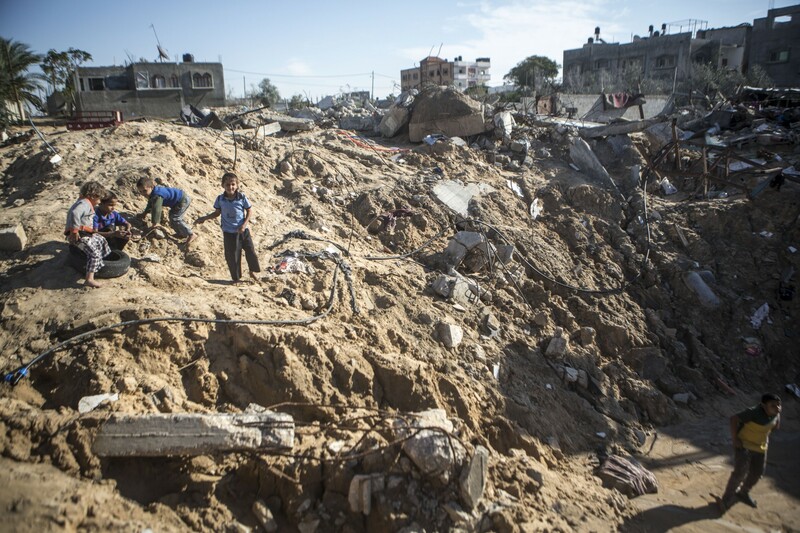 From behind a mound of dirt, we could see the tips of tanks and fleeting glimpses of Israeli soldiers. A group of villagers, desperate to check on family members left behind in the closed-off village, decided to try and advance. 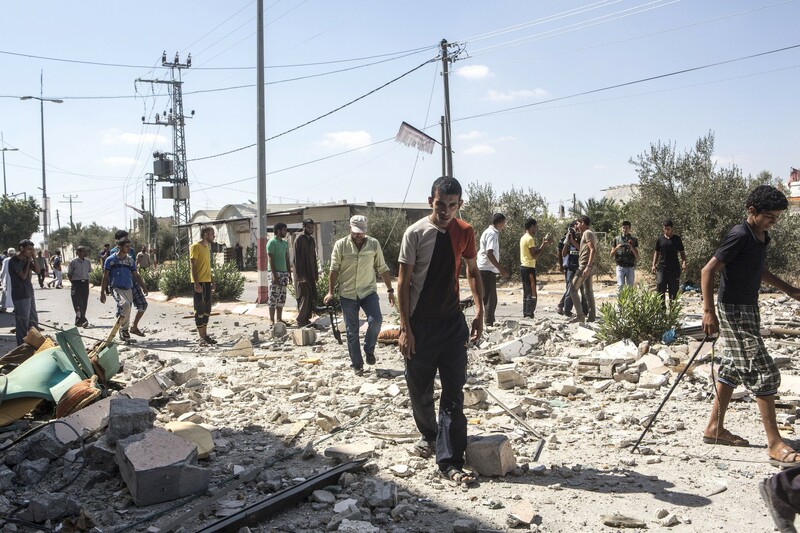 But before they could come close to the village gate, Israeli soldiers began to fire. Everyone in the street scattered, and so did we. Entrance to Khuza’a where soldiers opened fire on villagers trying to reach their homes. People were desperate to check on those trapped in the besieged village: two men decided to walk through the open fields, with their hands up, despite the risk of being killed. 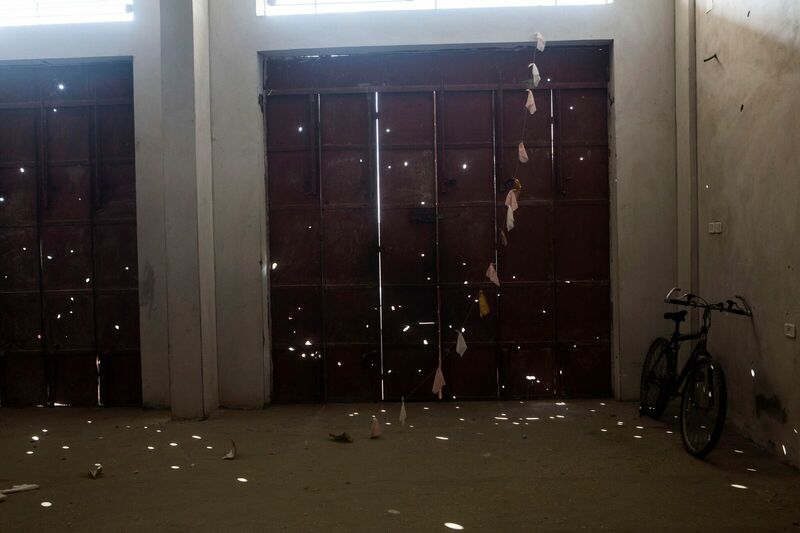 Entrance to Khuza’a where soldiers opened fire on the villagers trying to reach their homes. People were desperate to check on those trapped in the besieged village: two men decided to walk through the open fields, with their hands up, despite the risk of being killed. Israeli soldires began to fire. Everyone in the street ran away and so did we. On our way out of Khuza’a, we separated. Part of the group drove back up north, to see what had been left of Shuja’iyya, another border area flattened by Israeli fire just few days earlier. I stayed behind for another assignment. Still near Khuza’a, in the nearby village of Bani Suheila, I bumped into a funeral procession. Without thinking, I jumped out of the car and climbed onto the roof of a parked truck. People streamed down the street, carrying what seemed to be a sea of bodies, their white shrouds stained red. I quickly lost count: I was operating on auto-pilot again. Hussein al-Najjar, whose wife and two children’s bodies had just been carried past me in the procession, was sitting next to the site of an air strike. He was one of only three survivors. 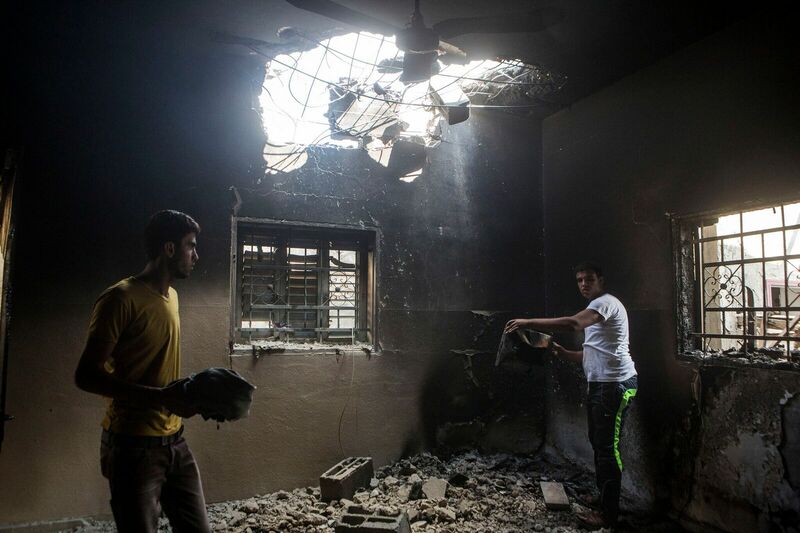 Hussein’s three-story home, with 22 family members inside, had been hit overnight. A bandage over one eye and in an obvious state of shock, the man looked as though he had one foot in the grave and another tentatively placed in the world of the living. Stumbling over his words, he tried to recount what had happened. He began to list the members of his family who had been killed: his uncles, his brothers and their wives… one of his relatives prompted him: “your wife and your children.” Hussein, staring down at the ground, repeated: “my wife and my two sons.” At that point, he was not even sure how many people had been killed. While we spoke, Hussein’s sister Mona quietly arrived. Sitting down opposite him and placing a hand on his knee, she collapsed into tears, muttering a stream of muddled words. Only then did Hussein break down, and I backed away. The memory of Hussein’s face, the shock and devastation etched in his eyes, never left me. 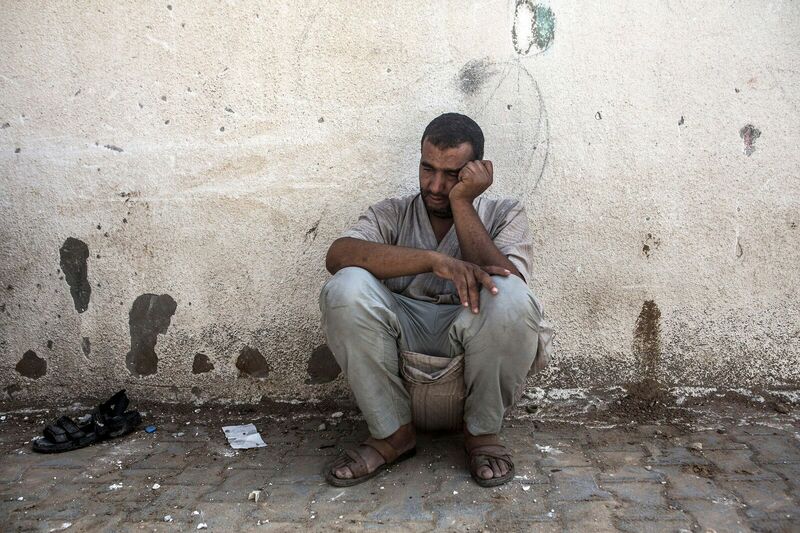 When I returned to Gaza four months later, I began to search for him. I wasn’t even sure of his full name – was it Hussein or Samir? 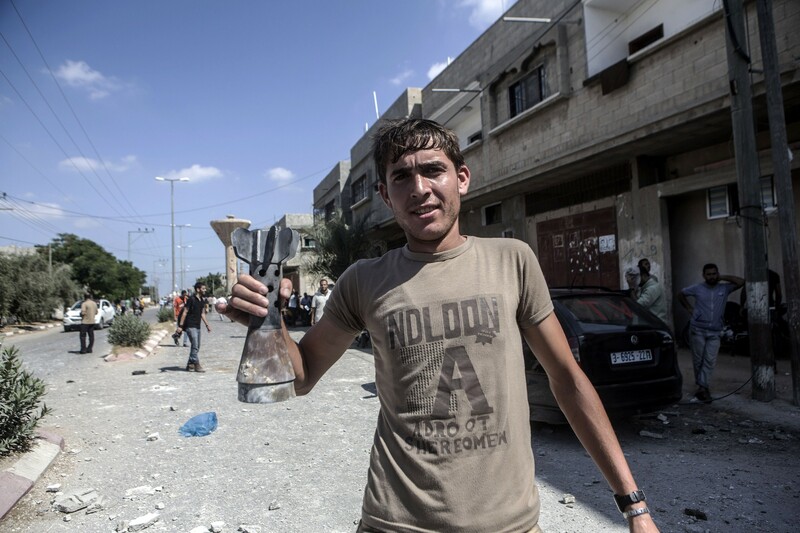 Al-Najjar is a very common name in the area and several other al-Najjar families had suffered from Israeli attacks. 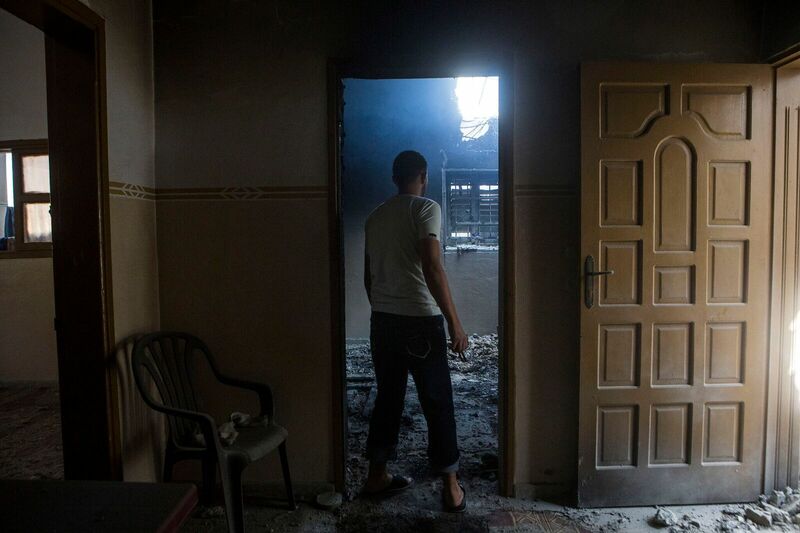 Over a glass of sweet tea in one of the al-Najjar families’ homes, I explained again: I was looking for a man who lost his wife Riham, two children, and many other members of his family in a single airstrike. The photo I carried with me helped and I eventually found him. When we finally met at the site of the attack, Hussein Samir al-Najjar reluctantly recalled once again what had happened. He told me that on the day of the bombing that two of his children – Hussam, 7, and Olfat, 4 – had insisted on staying at their Aunt Mona’s house: a coincidence that saved their lives. After returning home and putting his other children to bed, Hussein began to prepare for the early morning prayer. 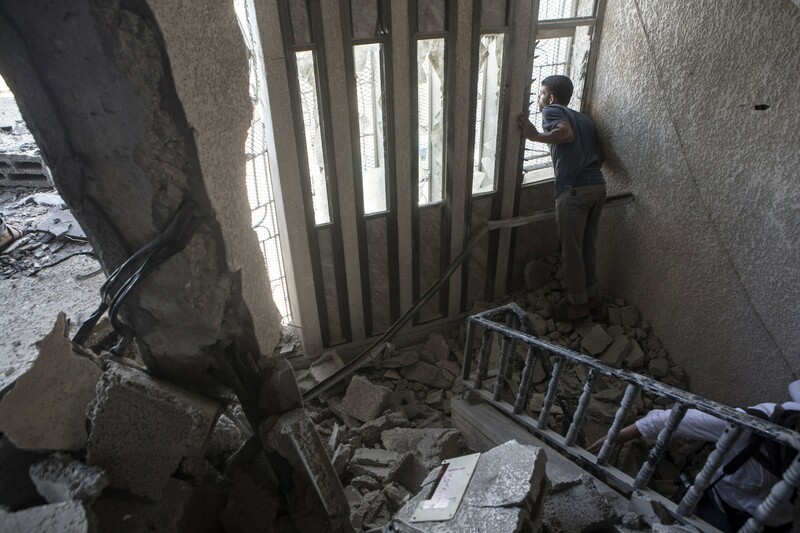 It was then that an Israeli pilot fired a missile into their home. The strength of the blast blew him completely out of the house. He landed in a tree a dozen meters away, unconscious. 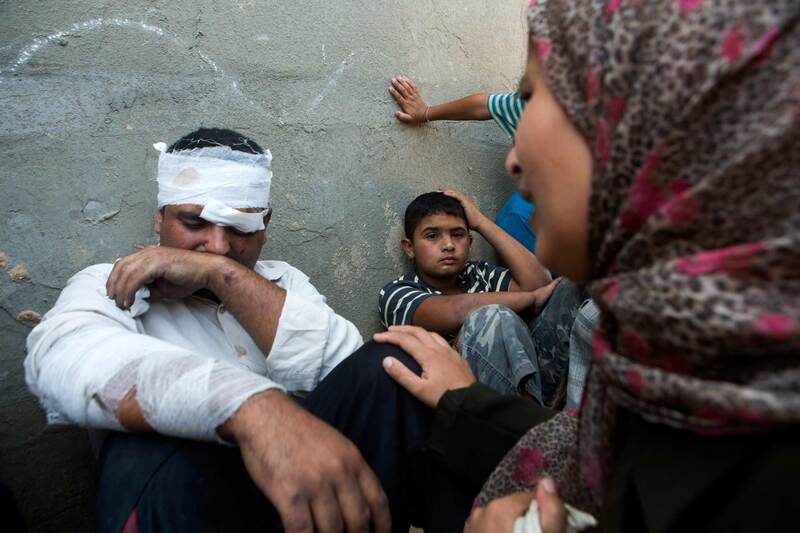 Hussein, his brother Mohammed, and their uncle Suleiman were the only survivors. 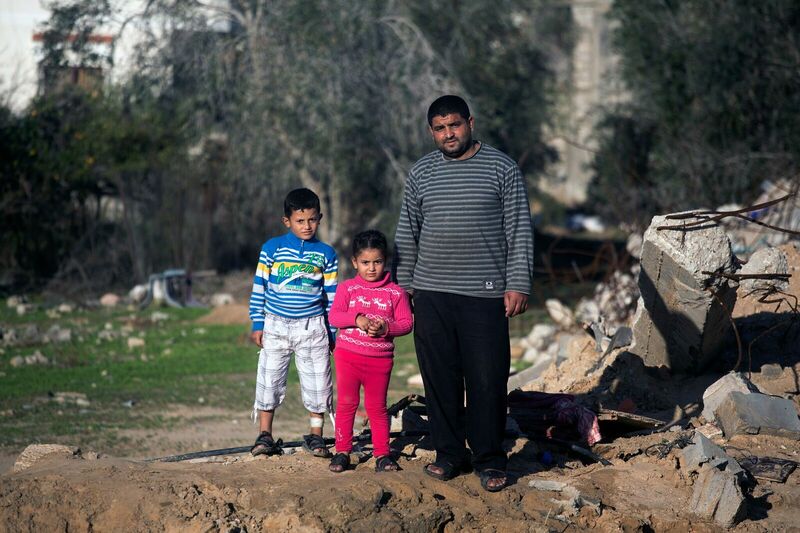 Hussein, one of the only three people to survive bombing of his family home, with his two children Husam and Olfat. Since the attack Hussam and Olfat – the two siblings who survived the blast – have been staying with another one of their aunts, in a tiny house just next to the crater where their home had once sat. Months after the strike, the children are constantly reminded of their loss. Olfat wakes up in the middle of the night, crying and cursing the heavens because that is where she was told her mother was taken. Hussam does not stop asking when he will see her again. Hussein sometimes answers: “Tomorrow, she will come back tomorrow”. While I was photographing the al-Najjar family children ran up and down the crater, as if it was the most natural of playgrounds. 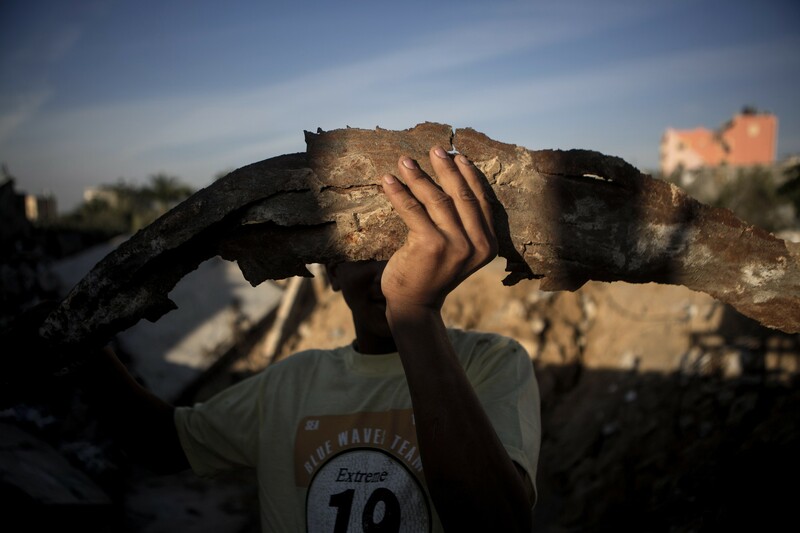 One boy climbed out of it, proudly displaying a piece of shrapnel. 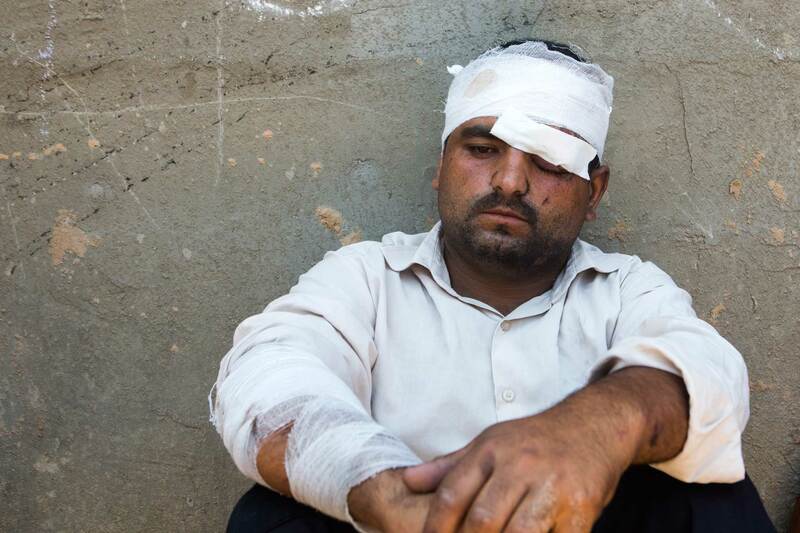 On the edge of the crater, I stood with Mohammed, Hussein’s brother. He wanted to speak. “Why do you only want to listen to Hussein?” he asked. I had focused on Hussein because I had continually thought about him after I left Gaza in the middle of the summer’s offensive. Mohammed told me about how the blast had melted his arm to the wall, and how, even though he was seriously injured, he had escaped from the hospital when he heard about what had happened to his wife, and his 18-month old toddler Ghalia. He told me of how he ran to the hospital morgue for one last goodbye. As I was leaving, I wanted to give Hussein the photo that had helped me find him. He didn’t want it. “I don’t want to remember that day,” he said, gazing toward the ground and shrugging. I was ashamed and cursed myself. I felt that for a moment I had lost that delicate balance between documenting the tragedy and bringing more sorrow into the already devastated lives of the survivors. 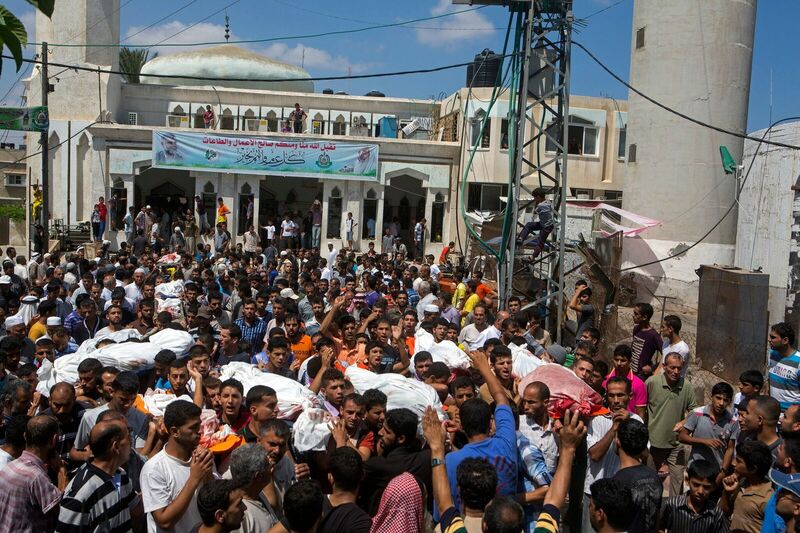 A constant flow of people – journalists, NGOs, human rights groups – demand that still grieving Palestinians recall the most painful of memories. 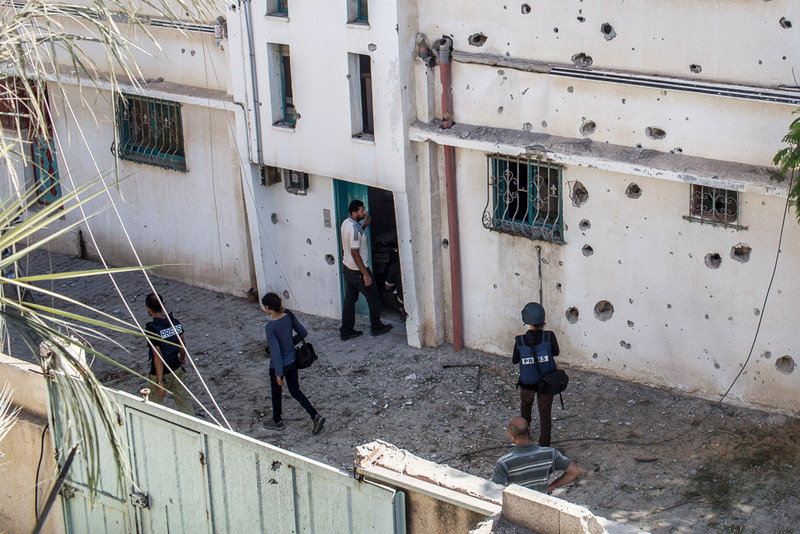 Everyone wants an original account of the attack, a piece of their intimate feelings, a few personal details… Three Israeli military offensives within six years have left Palestinians in Gaza weary of those interrogations, regardless of their good intentions. The photo that helped me find him. Hussein’s gaze carries with it the pain and trauma of Gaza, of those who lost friends, family members, neighbours and colleagues during last summer’s attacks. In Berlin, more than one year later, I look at the footage in our editing room and I can’t help but cry. I want other people to look too. I want them to know, and maybe to understand, even if just for the duration of that frame. 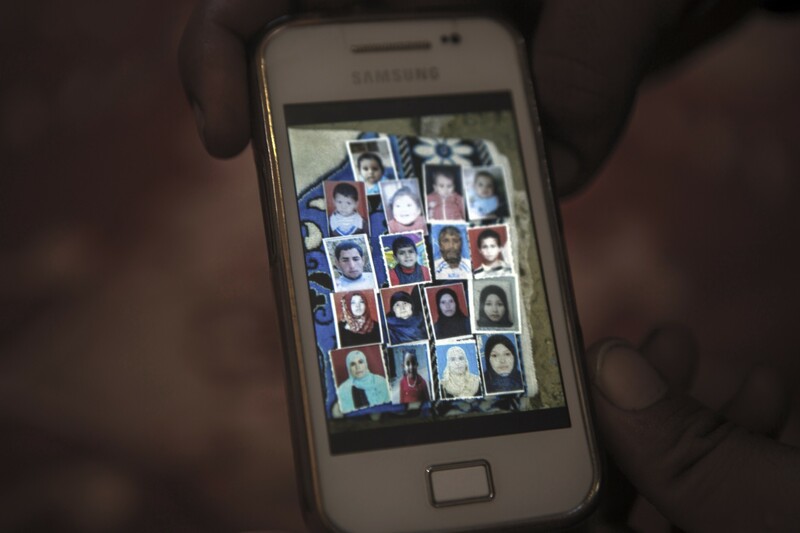 Photos of al-Najjar family, killed in the middle of the night, in their own home. Ten of them were children.